A-Plus Paint’s brand ambassadors the A-Plus PaintBabes welcome four new members into their ranks during a press conference during this year’s WorldBex Convention at the World Trade Center. The Filipino company, known for quality paints including industrial, house, automotive as well as construction chemicals has formed this group of beautiful and intelligent women to help raise brand-awareness as well as share their talents to bring joy to the people. The Paintbabes have been appearing in shows all over the Philippines, from one mall to another. They have also organized charity events like fun runs for a cause, gift-giving and feeding programs. 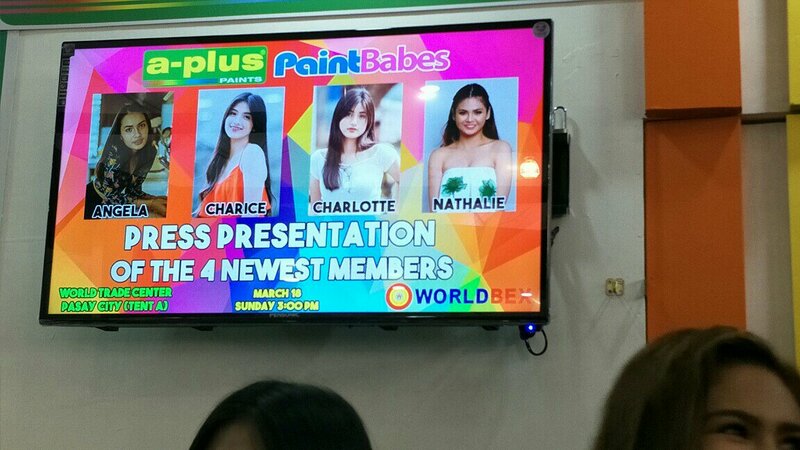 The new additions namely Angela Gloria, Charice Hermoso, Charlotte Hermoso and Nathalie Cole were selected as the top 4 competitors in an online audition for the next batch of A-Plus Paintbabes. This is also a first since the girls who become PaintBabes were usually chosen because of their exceptional beauty and talent. January marked the online auditions with more than 80 girls submitting their online audition videos. From there, only 12 girls were selected for the final screening which included an event held last February 18. The final four were then presented at a presscon organized by A-Plus Paints in World Trade Center. To learn more about A-Plus Paints and the A-Plus Paintbabes, visit their website: http://www.apluspaints.com/about-us.html and follow the on Facebook.